Another great cross-training tip: Use a jar! | Eat. Blog. Run. 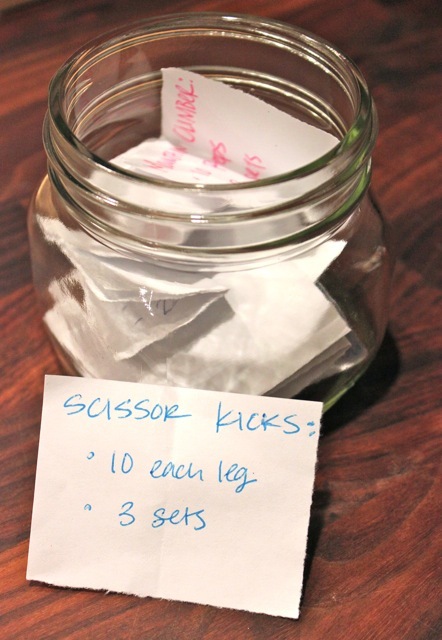 Home >> Blog >> Another great cross-training tip: Use a jar! My solution? The surprise-laden exercise bingo jar! First, I spent a little time googling good exercises to target both post-pregnancy belly and my other bete noire, that flappy underarm flab (or “chicken nuggets” as my Pilates teacher colorfully calls them.) 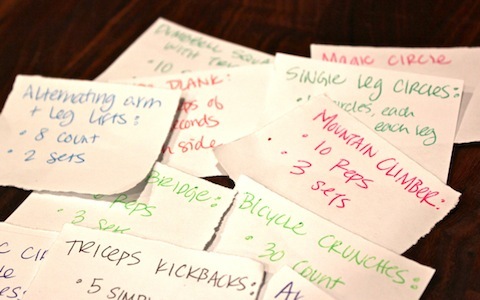 I picked 12 exercises and wrote them down on little slips of paper. I put the target number of sets and reps on each slip as well. Then I put the little papers in a jar in my kitchen. Every day I have to pull out five slips and do whatever they say. This makes it fun because I never know what I’m going to get, and it only takes about 15 minutes to get through all five exercises. Plus, I don’t have to do the most hated exercises every day –side plank, I’m looking at you– or get bored by doing the same routine over and over. Read the rest over at rookiemoms.com, including sample exercises for your own magic jar! I really, really like this idea!! Mitt takes office, sooner or later, the zombies will come for all of us. miter or radial arm or the throat plate on a table saw. There are a number of important areas to consider when making a purchase of an power tool, and table saws are no exception. However, along with their usefulness comes the potential for injury. The experimentation to create a new taste is always in the offing to create a market. change your diet and secondly use some natural products that help adjust your sugar levels without the side effects. more expensive and are bulkier. Thanks a buhch for sharing this with all people you actually recognise what you are speaking approximately!